Last July, midway through the month after returning from two weeks in Oregon, I took a plunge into my first lap swim at the CRC. Learning to swim sustained laps earned a place on my Summer Bucket List last year; moreso, I wanted a way to cross train and to try something that, to me, seemed a bit out of my reach. Or, at least, new. 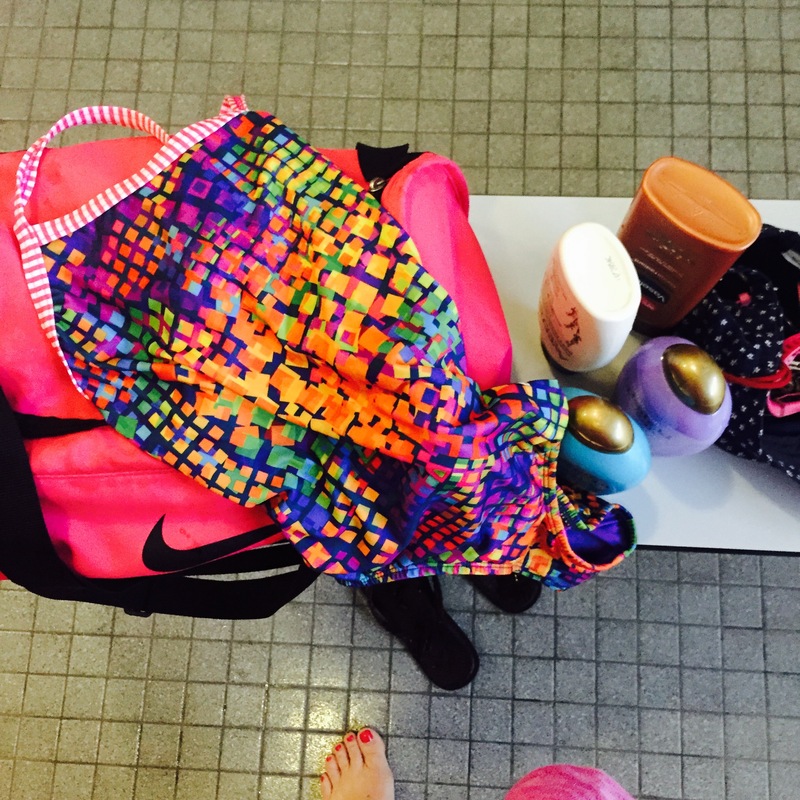 Last year’s blog about that experience showcased my newbie status: I swam my first laps without a cap and goggles. 1000 yards (it’s a yard pool) seemed like quite bit. It was autumn, or close, when I reached 2500 yards—on a “long day.” The 40 to 60 lengths I eked out last summer were challenging. I had never had a circle swim, the thought terrifying me; now they are standard on a busy morning at the pool. I never ventured into the locker room, wanting to sneak in and out as surreptitiously as possible. The thing is, though, when you’re new, you’re new. Part of this whole journey—and the use of social media in reporting about it—has been to be open about the struggle. To be transparent: it takes an awful amount of work to become what we hardly dared imagine we could be. There are days I don’t want to work. Runs that are not so great. Moments when I am just getting through it. I am the first to say: I am not the strongest, fastest, most naturally inclined at running or swimming. Other than the DNA that evolved to give our bodies some advantage in these areas, I would say most of us start out on a fairly equal playing field. There are some muscle fibers and variables that certainly contribute to sheer talent in some individuals; I don’t think that’s me at all. But I don’t want to be known for talent alone, anyway; I’d much rather leave to my children the legacy of my work ethic. I’ve always said, with respect to every accomplishment in my life, that what I feel I lack in talent I make up for with really hard work. I may have some proclivities, as we all do, but none of those mean much, or will amount to anything, without these two traits: loving to learn, and not quitting easily. In the past three years, I’ve had to remember that about myself. So: when at the pool, it’s okay to look the fool. It’s okay ALL of the time, really. Struggling means work which means effort. I knew a kid in school (more than one, really, as time went on) who was convinced that showing effort meant he would come across as less gifted. He cultivated a myth about himself that he never had to work; years later, I found out that all that time, he went home and spent hours studying. Why do that? Pretend, I mean. There’s honor in putting in crazy effort, which often means putting it all on the line. If we stay where it is easy? I don’t want rewards for that. Better to look like a newbie, working her way through with committed passion. Anyway, by autumn I would swim about 3.5 miles a week, maybe doing two 1750 yards and a 2500 yard a week. During Thanksgiving break, when Bill was home, I took one morning and went 3500 yards (140 lengths, 2 mi) just to see if I could. For the rest of December, it was back to my normal routine. I had read that the city aquatics department does an annual 100 Mile Swim challenge from January 1st to December 31st. All of December, I pondered filling out the paperwork and signing up. Did I really want to set that goal? (Because once set, it must be done). Would it be a genuine step for me in the direction of other goals? Would I feel overwhelmed? Could I be patient enough? Could I even finish it? Mentally, I had to try. Calculating my then-current routine, it seemed mathematically doable. 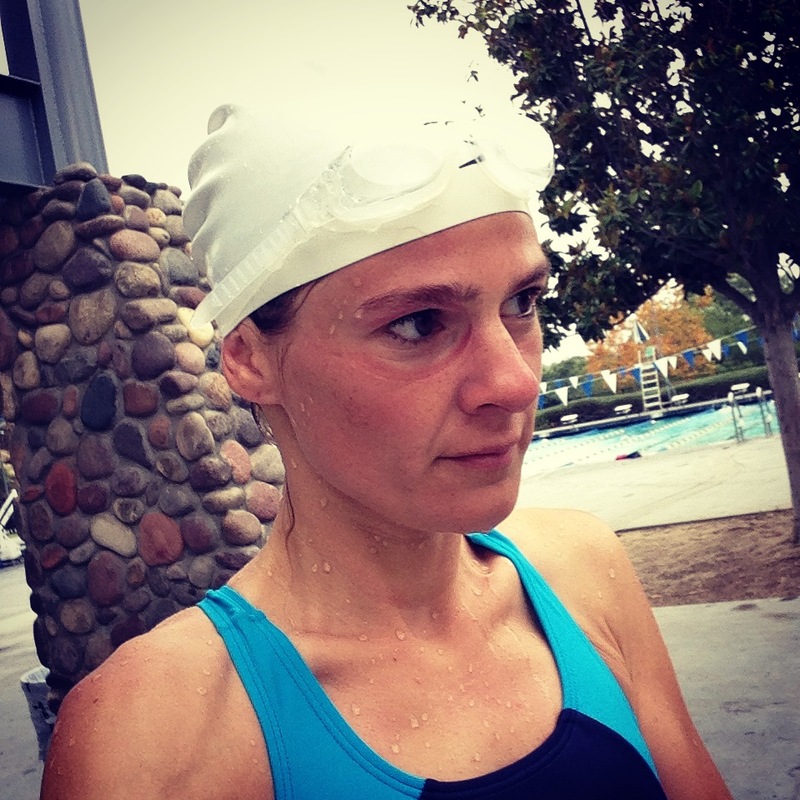 I had a moment of panic thinking about how I would need to miss a few scheduled days for pre-race tapers in March and again miss days while on a road trip (the miles had to be done in a Temecula pool to count toward the 100). Still, 100 miles seemed FAR away. A reeeeeeeeach. Some estimates put me at October, and that would have been about right if I’d stuck with my autumn routine of swimming three mornings a week at 3.5 miles a week, I think. I’m the girl who gets the syllabus in college and wants to try to read everything right away. You know? So those first weeks in January, it was almost torture to watch how slowly my boxes filled up. One small box equals 20 lengths (500 yards). Four small boxes together would be 80 lengths. 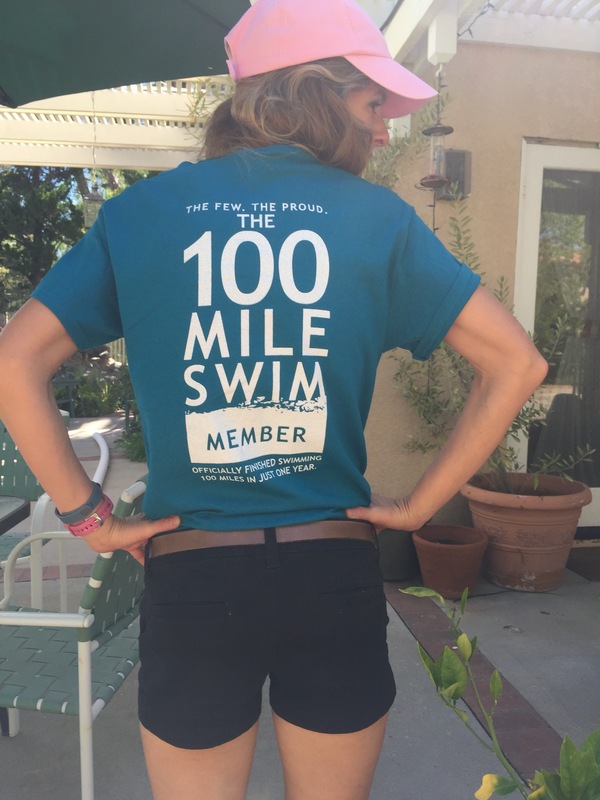 A “mile” is about 70 lengths. This challenge soon became less about the physicality of it, to a degree, and more about the mental discipline: I had to put myself into an ultra-patient and methodical frame of mind. A whittler. Trust the work. 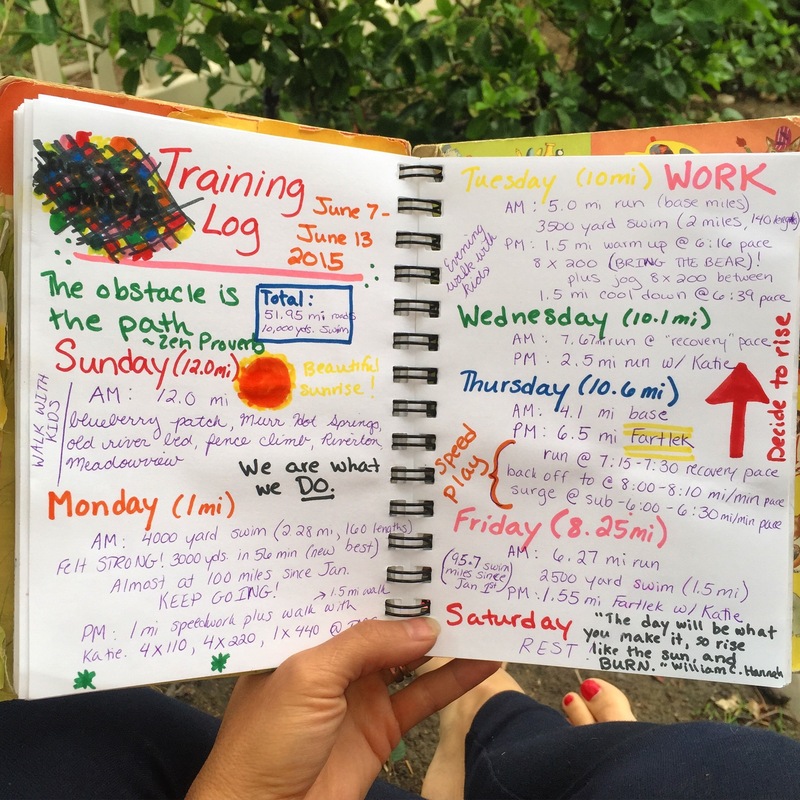 Trust the training schedule to get it done. On my first swim in January, I swam 70 lengths. The rules are that you can shade a fraction of a box, so for 70 lengths, I shaded 3 whole boxes (20 x 3) and half of another box. NOOOOOOPE. My Type A kicked into high gear that morning. The half box tormented me; no, I am not exaggerating. Half a box felt so…incomplete, messy. I couldn’t WAIT to get back to the pool, make up the ten remaining laps and then swim in whole sets of 20 from then on out. So right away, my swimming changed. The goal mechanism already affected it. I no longer ever swam 1750s (70 lengths) from that day forward; I always had to reach at least 80 in order to keep my neat-freakazoid side content with the box coloring process. (OWN those neuroses, come on people!). Life at the pool operates for me in whole sets of 20. That meant a base line swim was just over a mile. At some point I realized I could swim (physically and logistically) 2500 yards (100 lengths) every scheduled morning and still make it back before Bill had to start to work if I got up super early to fit my runs in beforehand and got to the pool at 5:30 AM. The boxes started going more quickly. Shortly before Valentine’s Day, I reached my 25th mile. 50 miles came the Monday following the Carlsbad 5000 in late March; 75 miles right before Mother’s Day. 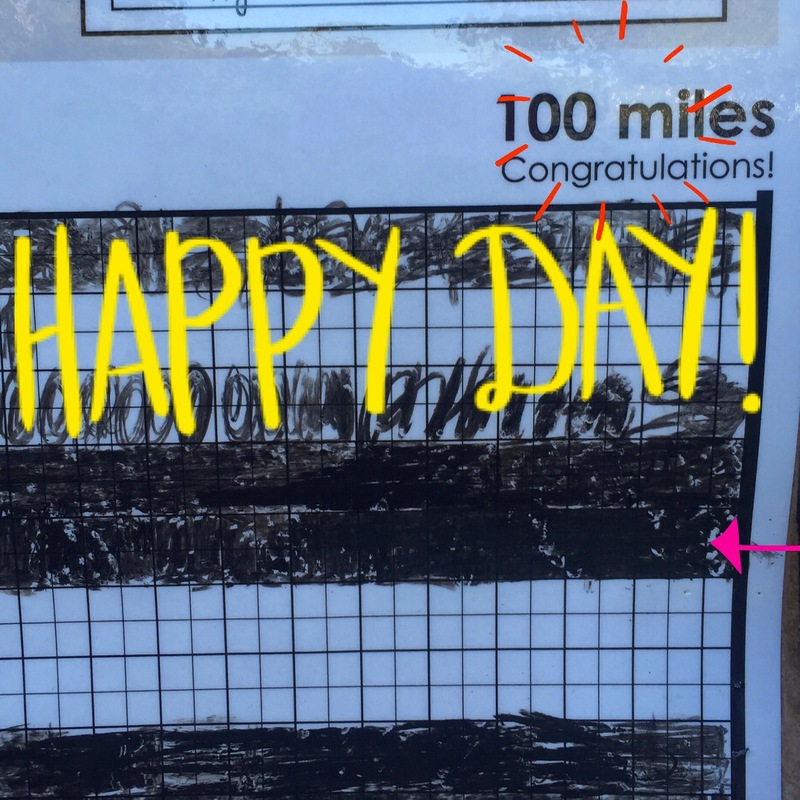 And today, though it seemed so very far away: 100 miles!!! It is like swimming from the CRC to the Santa Monica Pier. 400 times around a track. 7,040 lengths of 25 yards each in the pool. In contrast, since January first, I have put in 840+ miles of running on roads the past 5.5 months. 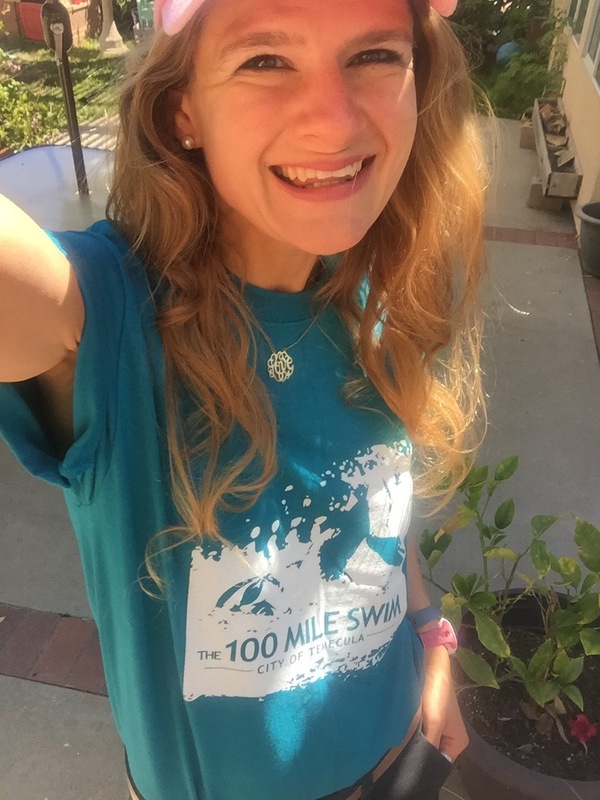 I never kept track of my swim miles in an organized way from last July to December 31st. But this has made me want to start. With 6.5 months left before the December 31st deadline, my new goal is to see if I can double my mileage to 200 miles. Eh, it’s a little daunting putting that goal out here, but at the same time, goals are powerful once stated. I know I can keep chipping away. I’ll keep track at home. Hoping Bill makes me a huge chart of boxes…just kidding, honey! It looks like I am the 13th person to have completed this so far this year. Tom C. had it done in a few weeks; he did it first last year, too. He swims. A lot. I went a bit wild now that Bill’s home for summer. Last week I did 10, 000 yards over three days (a 2.28 mi, a 2 mi, and a 1.5 mi). It occurred to me a week or so ago that if I ramped up, I could finish this goal before Oregon. Kind of too tempting… Yesterday I did another 2.2 mi (8 boxes worth), which means I had 7 boxes (3500 yards, 2 mi) left today. After running five base miles early (I do another five or so of speedwork on Tuesday afternoons always), I was at the pool at 5:30 AM. As I started, I reminded myself not to be impatient, just to sit inside the moment of the swim, enjoy it, feel it. The time will pass anyway. I had to get into a zone. I remember feeling a bit like I felt when birthing Eric: wanting the reward of getting to the goal (holding him that day) to the extent that patience was an issue as I labored on his birthday. So I really tried to cultivate a sense of determined, calm patience this morning and let the laps unfold. By the last 100 yards I got more emotional than I would have thought. I started tearing up in my goggles. Crying while plunging your head in and out of water and inhaling deeply is harder than it sounds, so really it ended up being more of a feeling in my chest. Like, whoa, you couldn’t swim laps hardly at all last year and now you can (fairly easily) do 2+ miles at a time and your big goal is just strokes away. Hard work and commitment are EVERYTHING. I promise. Whatever we think we’re bad at? Nope. We do not have to stay stuck. We can learn. If we make the effort, and keep at it, we can learn. So I made a conscious effort to study the sky and the way the rising sunlight glittered the water droplets flicking and flecking off my arms. My arms, which used to be so much weaker. My body, which used to carry an excess of 60+ pounds and could do none of this. Could feel none of this. And everything was gold, gold, gold in the bright blue rise of day.